On June 30, 2018, authorities in Toronto say that Abdulkadir Handule and a 16-year old accomplice, allegedly committed a triple shooting outside of a nightclub. Killed in the incident were 21-year old Ahvante Smart and 28-year old Ernest Modekwe. A third victim survived her injuries. Abdulkadir Handule now has a Canada-wide arrest warrant in regards to the nightclub shootings. 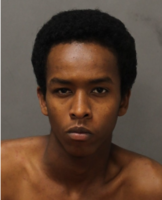 Based on crime location, it is advised to contact Toronto Crime Stoppers at 416-222-TIPS (8477) if you have any information on Abdulkadir Handule's whereabouts. Thoughts? As of today, February 4, 2019, Abdulkadir is one of the listed murder suspects on the Toronto Police Service's website. Since the shootings in June of last year there has been some on-and-off media attention on the manhunt, so thankfully it has not been forgotten. Of course getting Abdulkadir in custody would make the streets of Toronto or wherever he's hiding out a lot safer.